1. An apparatus for forcing a gas or liquid from or to any part. 2. Any mechanism for using metabolic energy to accomplish active transport of a substance. 1. an apparatus for drawing or forcing liquids or gases. breast pump a manual or electric pump for abstracting breast milk. calcium pump the mechanism of active transport of calcium (Ca2+) across a membrane, as of the sarcoplasmic reticulum of muscle cells, against a concentration gradient; the mechanism is driven by enzymatic hydrolysis of ATP. intra-aortic balloon pump (IABP) a pump used in intra-aortic balloon counterpulsation. sodium pump , sodium-potassium pump the mechanism of active transport, driven by hydrolysis of ATP, by which sodium (Na+) is extruded from a cell and potassium (K+) is brought in, so as to maintain gradients of these ions across the cell membrane. 1 n, an apparatus used to move fluids or gases by suction or positive pressure, such as an infusion pump or stomach pump. 2 n, a physiological mechanism by which a substance is moved, usually by active transport across a cell membrane, such as a sodium-potassium pump. 3 v, to move a liquid or gas by suction or positive pressure. Physiology A cell membrane-bound ion channel that maintains a gradient between one side and the other of H+, Cl-, etc. Therapeutics A device used to deliver a precise amount of medication at a specific rate. See Implantable pump, Implantable insulin pump, Infusion pump, Insulin pump Vox populi A device, structure or other artifice that causes a fluid or specific molecules to flow in a designated direction. See Breast pump, Colleague 3 infusion pump, Intra-aortic balloon pump, Lymphatic pump, Mechanical infusion pump, Proton pump. 1. An apparatus that transfers fluids or gases by pressure or suction. 2. To force air or fluid along a certain pathway, as the heart does to blood. 1. A device for pumping blood. It is attached to an extracorporeal circulation system. 2. A compression sleeve placed about a plastic transfusion bag. An apparatus for expressing milk from the human breast. A cell membrane protein channel that selectively admits or excludes chemicals from the cytoplasm. In some bacteria efflux pumps prevent their cells from accumulating antibiotics, contributing to drug resistance. A type of infusion pump inserted in the body. The pump, which may be programmable or nonprogrammable, is placed in a subcutaneous pocket and is connected to a dedicated catheter leading to the appropriate compartment or site. 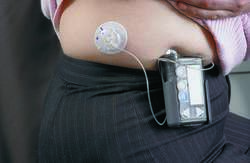 A small battery-driven pump that delivers insulin subcutaneously into the abdominal wall. The pump can be programmed to deliver varying doses of insulin as a patient's need for insulin changes during the day (e.g., before exercise or meals, when physical or psychological levels of stress change). A pneumatic compression device for application to an edematous limb. It works best when combined with elevation of the limb and manual massage. The device, which may be single-chambered or multichambered, is designed to provide calibrated, sequential pressure to the extremity. This action “milks” edema fluid from the extremity. It is essential that the device be used in the early phase of the development of lymphedema. If the affected lymph vessels develop fibrotic changes (i.e., scar tissue), then pneumatic compression devices are of questionable benefit. An enzyme located in the parietal cell of the stomach that excretes hydrogen ions in exchange for potassium ions. The formal name of the proton pump is hydrogen/potassium adenosine triphosphate (H+/K+ATPase). Gastric acids produced by the proton pump aid chemical digestion of foods. Some diseases and conditions are worsened by acid in the stomach (e.g., peptic ulcers, acid reflux disease). Drugs that inhibit the proton pump (proton pump inhibitors such as omeprazole) are used to treat these illnesses. Those abdominal and thoracic structures that contribute to the expansion and contraction of the lungs. Movement of the chest and abdomen alters central pressures during inspiration and expiration. During inspiration, decreases in intrathoracic pressure draw air into the trachea, bronchi, and lungs and draw blood into the vena cava and right atrium of the heart. During expiration, intrathoracic pressures rise, and air is forced out of the lungs. The active transport mechanism that moves sodium ions across a membrane to their area of greater concentration. In neurons and muscle cells, this is outside the cell. In many cells, the sodium pump is linked with the potassium pump that transports potassium ions into the cell, also against a concentration gradient, and may be called the sodium-potassium pump. In neurons and muscle fibers, this pump maintains the polarization of the membrane. A programmable infusion device used to control and administer intravenous drugs and limit medication administration errors. Its software may include some or all of the following features: infusion rate programming; dosing limit lockout features; configurations for specific hospital areas (pediatric dosing versus adult or intensive care unit dosing); surgical or anesthetic drug libraries; controls for patient-controlled analgesia; and alert features (alarms or messages that notify users of possible medication errors). A colloquial term for gastric lavage. The negative pressure in the chest during inspiration that pulls venous blood into the vena cava and right side of the heart so that it can circulate to the lungs. A device that alternates between applying pressure and no pressure on the sole of the foot. The change in pressure allows venous blood vessels to alternately fill and then empty, thus imitating the effects of walking on the veins of the lower extremities. The pump is used to prevent deep vein thromboses (DVTs) in patients at high risk because of a previous history of DVTs, hypercoagulable states, or prolonged bedrest. 1. Apparatus for forcing gas or liquid from or to any part. It has been suggested that the reduction in lower extremity muscle mass and muscle activity associated with aging may decrease the effectiveness of the skeletal muscle pump mechanism to limit central blood volume displacement to the LE in the upright position resulting in decreases in BP (8, 12, 20). No significant differences in EMG activity between or within groups were found, suggesting that the skeletal muscle pump did not significantly contribute to BP regulation in either group. These animals maintained nearly normal heart function and showed significant improvements in ejection fraction (how forcefully the heart muscle pumps blood) with no further cardio protection provided by gallein treatment. The device uses small electrical impulses to gently stimulate the common peroneal nerve, which in turn activates the muscle pumps of the lower leg that return blood towards the heart. Instead, the dead cells form scar tissue that is unable to contract when the healthy portion of the muscle pumps. Insulin also regulates two vascular smooth muscle pumps. In this form of heart failure, the heart muscle pumps well, but its walls become so thick and stiff that the heart cannot fill properly. Feet and ankles can become swollen when we stand or sit for long periods because the muscle pumps in our legs which push all the extra fluid back towards our heart are not working and the fluid begins to build up in the veins in our legs.